Photo right: Here are some of the faces of those serving at Mississippi Wesley Foundations. There are 23 sites in the state, nine full-time leaders and 13 part-time campus ministers. Three college campus ministry trainings recently occurred to help Mississippi Conference campus ministries this fall. The training sites were in locations across the state including Christ United Methodist Church in Jackson, the Wesley Foundation at the University of Southern Mississippi in Hattiesburg, and the Ole Miss Wesley Foundation in Oxford. The primary focus of the training involved board development, and fundraising. 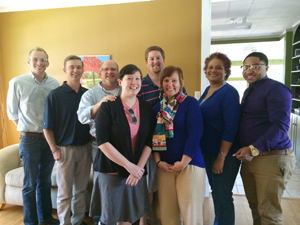 Campus ministers were asked to bring their vision for their Wesley Foundation for the year. They practiced sharing that vision with each other in a way that prompts others to ask questions about the Wesley. From these questions, conversations can ignite, goals can be shared, and relationships can be built to gain support for Wesley Foundation ministry. It is through these relationships that needs are met within college campus ministry. The leaders were also asked to bring a list of their board members. Each campus minister listed gifts, talents, and qualities of each board member in hopes of helping connect these servants with their area of giftedness in Wesley ministry. Campus ministers also learned new ways to invite people to join in their ministry, tips to making a plan for volunteers in ministry (how to follow through with those plans) and strategies to connect with board members. Along with the formal training, came a relaxed time for them to eat a meal together and hear each other's' life stories and ministry. One of the topics discussed was the need for campus ministries to be more connected for the purpose of serving each other and sharing resources. Ways to do this were fleshed out and plans are already being put into place. Much time was spent in prayer for each other, the students, needs of each ministry, professors and administrators, facilities, personal health, families, and much more. One person shared, "I believe we all went away feeling more connected to each other as colleagues, friends, and servants for the unified call that Christ has put on our hearts to minister to college students." If you are interested in learning how you can become more involved in your local Wesley Foundation, contact Allyson Willis at awilliscampusministry@gmail.com.